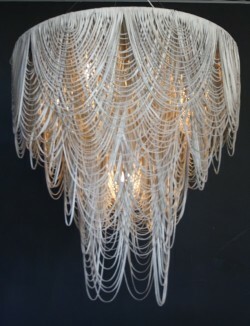 Handmade leather chandliers that create ambient light made in South Africa. Please note pricing is based on the standard stone colour. There is a price increase of $200 for custom colours including grey and black. As pictured a black small chandelier (50cm) and a stone large chandelier (82cm).